Summers can get expensive when you are trying to entertain multiple children so I find it extremely helpful to take advantage of all the free or discounted events happening around the city. This means Tuesdays are for museums, The Cummer Museum to be exact. Thanks to the generous support of Florida Blue anyone can enjoy free admission every Tuesday. Guest get to explore the galleries and gardens at no cost at all. After taking in the gardens we head inside to cool off from the hot Florida weather and explore the galleries. At this point, Aya and Lennox like to stop by the CREATE Kiosk to grab a create box. The create kiosk provides boxes filled with color pencils, a clipboard, and paper. Your little artist can find a spot that inspires them and make their own masterpieces. I love the fact that they provide these it helps to keep the little ones entertained. These are also free you just return the box when you are done. 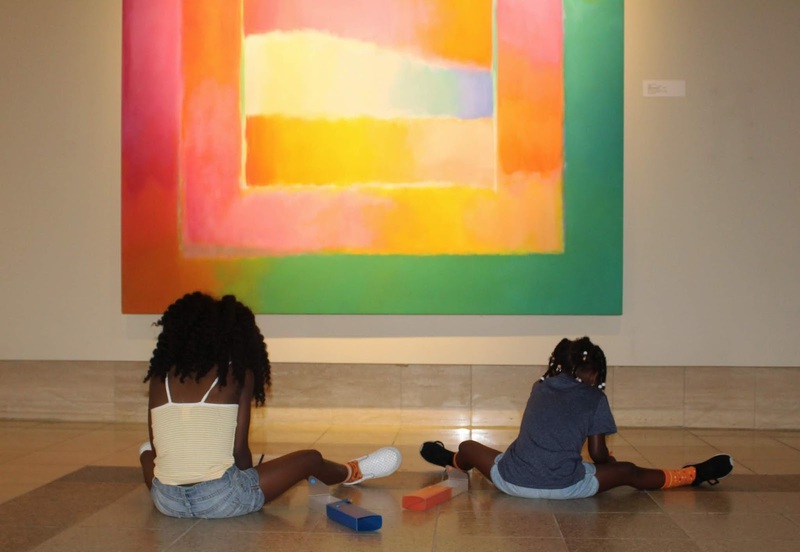 Our visit always ends at Art Connections because once the kids are here they are no longer interested in any other part of the museum. This section is also the perfect opportunity for parents to take a seat and catch their breath. 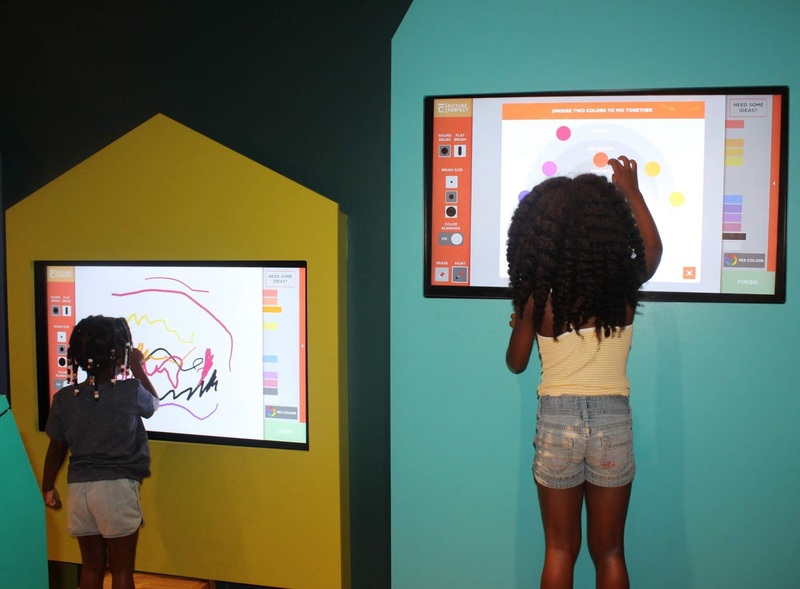 The interactive center is great for people of all ages. They provide so many different ways to explore art. It's like a hands-on art museum and we all know how much kids love hands-on ANYTHING! *The creativity timeline chronologically displays over 30,000 years of art history into 40 feet of interactive stations. *The gallery under five section allows your littles ranging from ages 18 months to about five to enjoy art on their level. *Face to face allows guest to create their own self-portraits through a touchscreen and can be printed out and taken home. This is Lennox favorite activity we have an entire collection of her printouts. *In the visions/versions section The Cummer Museum gets four different artists to create work inspired by the museum gardens. Guest can then check the art out and watch a video of the artist talking about what inspired the work, the tools, and the techniques they used. We absolutely love The Cummers Museum and to be able to experience all of this for FREE is definitely a mom win! Can't make it on free Tuesdays? No worries admission is pretty affordable. school's just around the corner so we are trying to get our last bit of fun in while saving money for those back to school shopping trips. What are some money saving adventures you and your family like to go on? That’s so cool! I wish we had free admissions in Toronto! Take advantage girl! It's a great educational and fun time outing. The kids love being creative and interacting with other children their age. Way to go! This is a great museum for kids! I need to look into what my city offers as well and take advantage of the great educational opportunities.